Chinaworker.info – Britain: What lies behind UKIP? The UK Independence Party (UKIP) was founded in 1993. During its first ten years it stood in 25 parliamentary by-elections averaging a modest 1.7%. At that stage, the party focused almost entirely on campaigning for Britain to leave the EU and saw itself primarily as a pressure group aiming to push the Tory party in a more euro-sceptic direction. Yet in 2014, UKIP won the European elections with 27.5% of the vote; the first party outside of the ‘big two’ to win an election nationally since 1910. UKIP had done well in European elections before, winning 16% in 2004 and 2009. On both occasions it sunk back to less than 5% at the subsequent general election. This time is different. In 2014, UKIP also won 17% in the council elections which were held on the same day. In the second half of the year it won two parliamentary by-elections, both with defecting Tory MPs as candidates. The party’s support has dipped slightly in recent opinion polls but in most it is still on over 10%, and looks set to be an important factor in the general election in May. In 2014, six in ten UKIP voters described their vote as a general protest because they were “unhappy with all established political parties at the moment”. According to ‘Revolt on the Right: Explaining Support for the Radical Right in Britain’ (Robert Ford and Matthew Goodwin, Routledge, 2014): “UKIP’s revolt is a working-class phenomenon. Its support is heavily concentrated among older, blue-collar workers, with little education and few skills; groups who have been ‘left behind’ by the economic and social transformation of Britain in recent decades, and pushed to the margins as the main parties have converged in the centre ground. 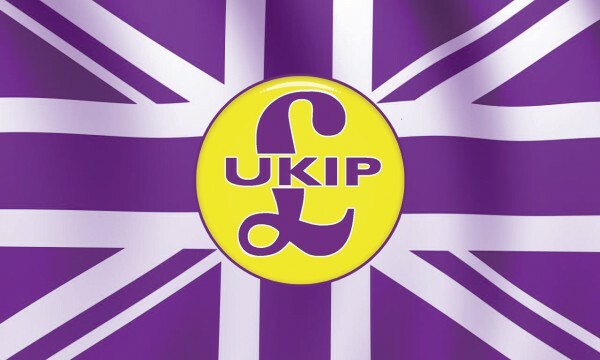 UKIP are not a second home for disgruntled Tories in the shires; they are a first home for angry and disaffected working-class Britons of all political backgrounds, who have lost faith in a political system that ceased to represent them long ago”. The class background of UKIP’s leadership has changed little since its foundation. Almost 40% of its prospective parliamentary candidates for the general election attended private school, second only to the Tories, and compared to 7% of the general population. Nigel Farage, leader of UKIP, portrays himself as a beer-drinking, smoking, ‘man of the people’, yet was educated at the elite public school, Dulwich College, and was a Tory-supporting City trader for 20 years. Talking about working in the City in the 1980s, Farage said: “I was handling millions and drinking more or less continuously. If I’d concentrated on business I would have been a very wealthy man”. This ‘man of the people’ actually spent decades as a second-rate Gordon Gekko. The treasurer of UKIP was until last year the multi-millionaire, castle-owning Stuart Wheeler. He continues to donate to UKIP but has been replaced as treasurer by Andrew Reid, a former deputy high court judge and racehorse trainer! While the City of London still gives the lion’s share of its political donations to the Tory party, UKIP is also getting increased support. A large part of its funding comes from that minority of financiers and hedge-fund managers who believe the City would be better off freed from the ‘constraints’ of the EU. Donations increased sevenfold in 2013, largely from finance capitalist donors, several of whom also gave to the Tories. The ‘venture’ capitalist and CityLink boss, Jon Moulton, who made over 2,300 workers redundant on Christmas day, is one businessman who has given to both the Tories and UKIP. The growth in UKIP’s electoral support, however, has largely been the result of reaching out beyond its initial base of ‘disillusioned Tories’ and gaining votes from ex-Labour voters. UKIP threatens more Tory seats than Labour ones in the coming general election, but its electoral strategy was described in the Economist (14 February) as being, “to come to second in some 50 or 60 northern Labour seats this May and thus be in a position to win them at the next general election. That explains why… UKIP held its annual conference last year in Doncaster and why Mr Farage will spend much of the election campaign touring in the north”. This strategy is not without foundation: UKIP has come second in a number of northern by-elections, in South Shields, Barnsley Central, Middlesbrough, and Heywood & Middleton. Polling by Tory peer Lord Ashcroft in 2012 also backs up UKIP’s strategy. According to Revolt on the Right, Ashcroft polled over 20,000 people and held 14 focus groups with UKIP voters in 2012: “The UKIP voters he talked to showed little interest in EU policy or public policy in general. Instead, they were drawn to UKIP by the party’s critical messages about the state of British politics and society… But Ashcroft’s research highlighted another important finding, which received little attention at the time: UKIP’s support was heavily concentrated in more disadvantaged and insecure groups in British society”. Revolt on the Right also makes the point that UKIP’s more working-class voters are critical to it making a breakthrough, because they are more likely to vote for it in parliamentary and council elections. It describes the party’s ‘strategic’ voters (who only vote for it in the Euro elections), as: “More likely to be middle class, financially secure and to have grown up in Conservative-voting households, and they are less hostile to the Conservatives. In other words, strategic UKIP voters look like strongly euro-sceptic, but otherwise typical, Conservative voters”. How has this party of stockbrokers and ultra-euro-sceptic Tories been able to attract the votes of a significant section of ‘angry and disaffected working-class Britons’? One important factor is the way it has gained an echo by falsely blaming immigrants for the problems workers face. However, the biggest factor is disillusionment with the major establishment parties. UKIP’s support jumped at the time of the expenses scandal, as anger with the ‘Westminster elite’ reached a new peak. It is likely that it will make further gains from the latest ‘cash for access’ scandal, involving Malcolm Rifkind and Jack Straw. The undermining of the social base of the establishment parties has been taking place over decades but is now reaching a tipping point. This process has been reflected in both falling support for all the major parties and a falling turnout in elections. In the 1951 general election, 82% of people voted and 97% of them supported the Tories or Labour. By 2010 turnout had fallen to 65%. In May the two big parties are likely each to get barely a third of the vote. In large parts of the country it is impossible for a Tory to get elected, such is the class hatred for them. This was the case in 2010 – only 24% of the potential electorate voted Tory – but is even more the case now after five years of brutal austerity. The Liberal Democrats, who once played a role as a ‘protest party’, have been virtually annihilated by their participation in the coalition government. The key to understanding the growth of UKIP is not only the unpopularity of the Tories and Liberals but, above all, of Labour. In the past, while Labour had a capitalist leadership, it also had a mass base among the working class, which was able to exert pressure on the party via its democratic structures. Today, Labour is no longer a capitalist workers’ party, but one more capitalist party. When Labour was in power, between 1997 and 2010, it lost five million votes, the majority of which Ed Miliband has signally failed to win back. This is no surprise given that Labour’s response to Tory austerity is endless promises that they will make cuts, too. This was summed up by the vote in the House of Commons committing the next parliament to another £30 billion-worth of cuts. Incredibly, only five Labour MPs voted against this pledge for never-ending austerity. Of course, many of those who are angry with the establishment parties would never vote UKIP because they are repelled by its right-wing populism and the racist and sexist attitudes of its leaders. It is noticeable that UKIP support is much lower among women than men, for example. Up to now, UKIP has also received a lower vote in London, which has a younger and more ethnically diverse population. However, that does not mean that those who vote for it necessarily agree with its neo-liberal programme or the attitudes of its leaders. A significant section, perhaps even the majority – like the voters quoted above – simply brush these aside as they pick UKIP up as a convenient weapon. On many issues the majority of its voters are to the left, not just of the leadership of UKIP, but of all of the establishment parties. One YouGov poll showed 78% of them support the renationalisation of the energy companies, 73% renationalisation of the railways, and 57% want zero-hour contracts banned. Over 80% of UKIP voters think big business takes advantage of ordinary people. There is nothing automatic in these voters’ support for UKIP. Rather, it has happened as a result of the absence of any genuine mass voice for the working class. In 2011, when the TUC mobilised 750,000 people on a massive anti-austerity demonstration, UKIP supporters attempted to respond with a pro-cuts ‘rally against debt’. Farage found himself addressing a few hundred people at most. This was the balance of forces at that point in time. Imagine if, instead of continuing to call for a Labour vote, the TUC had used its demonstration to launch an anti-austerity, pro-working class, political party. In that situation, UKIP would not have been able to do what it has over the last four years: partially fill the huge vacuum that exists as a result of the pro-capitalist, anti-working class policies of all the major parties. Huge coverage for UKIP by the capitalist media has also been an essential element in its success. Between 2009 and 2013, UKIP spokespeople were on the panel of Question Time 21 times, almost double the number for the Greens and more than double the number for Respect, both of which had an MP, unlike UKIP at that time. UKIP’s coverage in the capitalist media surged dramatically over the same period. In 2003, the party was mentioned less than 600 times. In 2013, it was referred to more than 23,000 times. This was not simply the result of UKIP’s electoral success. On the contrary, it made electoral breakthroughs (in the European elections) in 2004, 2009 and then 2014. But it was from 2011 to 2013 that its coverage increased exponentially. This was a semi-conscious policy by the capitalist media, recognising the depth of anger with the political establishment and attempting to channel it, from their point of view, in a relatively safe direction. For much of UKIP’s history it was being outpolled by the far-right British National Party (BNP). In the 2010 general election, for example, of the 303 seats where both parties stood, the BNP finished ahead in 176. There is no doubt that UKIP represented a more palatable alternative for the capitalist class than the BNP, with its neo-fascist origins. For now at least, partly due to the level of publicity it has received, UKIP has completely marginalised the BNP which is in a state of disarray. Even more important to the capitalist class than marginalising the BNP, however, was its anxiety to prevent the development of a genuine anti-austerity party. The Trade Unionist and Socialist Coalition (TUSC) suffered an almost complete press blackout in last year’s election, despite standing over 550 candidates in the council elections. Nonetheless, it would be wrong to conclude from the capitalist media’s role in the growth of UKIP that it is completely harmless for the capitalist class. It certainly isn’t harmless for the major capitalist parties! It is possible that UKIP votes could prevent the Tories coming out of the general election as the largest party. And, if the Tories do scrape through, the presence of UKIP MPs will be a nightmare for both the capitalist class and the leadership of the Tory party. David Cameron has managed to hold his party together on the issue of Europe – despite the virulent euro-scepticism of the majority of his backbenchers – by deferring the whole issue into the next parliament. From 8 May onwards, it will threaten to explode. The majority of the capitalist class undoubtedly wants Britain to stay in the EU but Cameron would face a revolt on the issue from his party, with the real possibility of major splits. All of this would be gleefully fed by UKIP. More generally, the worst general election outcome for the capitalist class is also the most likely. Beyond May we are likely to see a weak and divided coalition or minority government, which would be incapable of acting effectively in the interests of the capitalist class. UKIP is one of the destabilising factors making this more likely. Therefore, since its 2014 electoral breakthroughs it seems that the press coverage of UKIP has become more hostile, and perhaps has even decreased. Farage whines about the racist comments of UKIP councillors being splashed all over the papers. But he is correct that many of these councillors made the same comments when they were still in the Tory party, and it didn’t get a line in the press. The real problem for the capitalist class is the fracturing of politics. The undermining of the social base of the establishment parties is increasingly limiting the ability of the capitalist class to rule effectively. 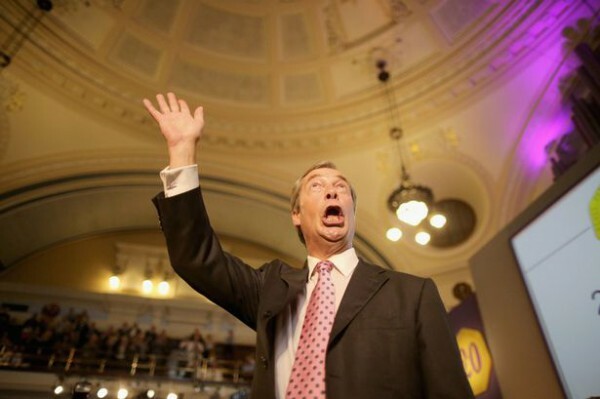 The success of UKIP’s right-wing populism is a symptom of this process, not its cause. While there can be further attempts to clip UKIP’s wings through bad publicity, there can also – in the future – be further attempts to boost it, particularly as an alternative to a new mass workers’ party. As UKIP has gained from angry working-class voters the tensions within the party have increased, along with the potential for instability and splits. Such is the heterogeneous character of UKIP’s members it is not even excluded that a few UKIP councillors could refuse to vote for cuts. The party leadership, however, remains to the right of the Tory party. When Margaret Thatcher died, Farage said he was the only politician “keeping Thatcherism alive”. He has since attempted to distant himself from Thatcher’s legacy, describing it as “divisive”. Farage has dismissed the party’s 2010 election manifesto as “drivel” and “nonsense”, saying that UKIP has gone back to a blank sheet of paper for the 2015 elections. At the time of writing, it has not published what has been written on that blank sheet, but it is clear that UKIP is attempting to lean left on a number of issues. UKIP spokespeople have called for the abolition of the bedroom tax and ‘strict limits’ on zero-hour contracts. The financial affairs spokesperson has said that UKIP would consider calling for the renationalisation of the railways. This ‘left gloss’ remains very thin, however. Although the party has abandoned its previous call for a ‘flat tax’ set at 31%, it still advocates reducing the top rate of income tax to 40%, and describes Labour’s mansion tax proposal as “equally unconscionable” as the bedroom tax. Farage has repeatedly made remarks about how, in his view, it will be necessary to scrap the NHS for an insurance based system in the future. Others in the party leadership have hastily denied that this will become UKIP policy, as it would be political suicide. If beyond the election a Tory minority government had to rely on the support of UKIP MPs, it would be a symptom of the dramatic growth of political instability in Britain. It would also potentially begin to undermine UKIP’s status as a protest party, and limit its ability to gain support in working-class areas where the Tories are hated. Nonetheless, while UKIP, like all populist parties, is inherently unstable, this does not mean it is about to fall apart. On the contrary, given the scale of the vacuum, it can be a semi-stable force in politics for a period. UKIP’s anti-immigrant propaganda is an important element in how the disparate supporters of the party are currently clinging together. The major capitalist parties are all trying to cut across UKIP by being even ‘tougher’ in their language on immigration. This only fuels support for UKIP. Socialists have to stand clearly in defence of the rights of migrant workers and asylum seekers. We have to lay the blame for the crisis where it belongs: with the billionaires, bankers and the capitalist system. UKIP, however, will never be defeated simply by denouncing its voters as ‘racists’. While racism is clearly an important factor for some UKIP voters, it would be a mistake to suggest that all, or even most, UKIP voters are hardened racists. In a recent YouGov poll, 28% of UKIP voters said they held ‘racist views’. Obviously, a poll based on self-assessment of your views is not necessarily accurate. Nonetheless, simply attacking UKIP as a party of ‘racists and bigots’, as does the ‘Stand Up to UKIP’ campaign initiated by the Socialist Workers’ Party (SWP), will do nothing to split away the 72% of UKIP voters who do not consider themselves racist, some of whom are clearly on the left on many issues. In fact, while more UKIP voters stated that they held racist views than voters for the main parties, a significant minority for all the parties did so: 22% of Tory, 13% of Labour, and 12% of Lib Dem voters. Immigration is not only an important issue for the majority of UKIP voters. The 2013 British Social Attitudes Survey shows 77% of people thinking immigration should be reduced. Recent YouGov polls show around 35% of people think it is the most important issue facing Britain, second only to the 47% putting the economy first – although other polls now put the NHS first. While racism and nationalism are part of anti-immigrant feeling, there are many consciously anti-racist workers who are concerned about the level of immigration. This reflects a widespread and deep-seated feeling that the scale of immigration is a threat to the wages and living conditions of workers in Britain. Only the creation of a mass workers’ party, with a socialist, anti-racist programme, would be able to seriously cut across this mood, and also to undermine UKIP. Crucially, it would explain that the only way to stop big business using migrant workers – and young workers, agency workers and others – as a means to drive down the general level of wages is to fight for the rate for the job for all workers, and for union organisation, regardless of what corner of the world they originate from. At a local level the successful Lindsey oil refinery strike in 2009 demonstrated how quickly it was possible to convince striking workers that the issue was not ‘British jobs for British workers’ but the ‘rate for the job for all’, and ‘workers of the world unite’. This was achieved with one Socialist Party member on the strike committee. Imagine what would be possible if a mass party existed that put a programme for workers’ unity. The Trade Unionist and Socialist Coalition (TUSC) was co-founded by the late Bob Crow, then general secretary of the RMT, in 2010, “to enable trade unionists, community campaigners and socialists to stand against the pro-austerity establishment parties”. Since 2012 TUSC has had the official support of the transport workers’ union, the RMT, plus support from a wide range of high-profile trade unionists. TUSC is aiming to contest over 100 parliamentary seats and over 1,000 local council seats in the elections on 7 May 2015. It represents a step towards the kind of mass workers’ party that could cut across the growth of UKIP. It will be crucial to the building of such a party that it stands clearly in opposition to all of the capitalist establishment parties. This may sound obvious but, unfortunately, it is not to some participants in TUSC, particularly the SWP. The Stand Up to UKIP campaign it has initiated includes joint leafleting, media stunts, launch meetings, etc, with Labour and the Liberal Democrats. This is different to participating in demonstrations – and other forms of practical co-operation – even sometimes with capitalist parties, in order to defend democratic rights against attack from fascist organisations although, even then, workers’ organisations should maintain complete political independence. But UKIP is not a fascist party, a physical threat to workers’ organisations, and it must be confronted politically, with no blurring of banners. This is certainly not the agreed policy of TUSC – and the Socialist Party would resist any attempt to make it so – as it goes against the very basis of the coalition, to develop independent working class political representation. Political unity with establishment parties cannot reach workers looking to UKIP. At the same time, it allows Labour, in part, to ‘use’ those opposed to UKIP to bolster its position. It is anger at the establishment parties that has fuelled UKIP’s growth. It is vital to oppose UKIP, but campaigning together with Labour and the Liberal Democrats against it will only allow UKIP to claim that socialists are ‘no different to the rest’ when, in reality, it is UKIP that is the ‘establishment’s anti-establishment party’.